In 2009 and the following 2010, we have encountered the first case (Case 1) and the second case (Case 2) of anomalous arterial blood supply to the colon in our anatomical practice for the medical students. The human colon which consists of the ascending, transverse, descending, and sigmoid colons is generally supplied by arterial branches from the major superior and the minor inferior mesenteric arteries. It has been considered that the proximal colon supplied by the superior mesenteric artery is derived from embryonic midgut, while the origin of the distal colon supplied by the inferior mesenteric artery is embryonic hindgut, though the definitive boundary is unclear practically in the adult human. In fact, the branching patterns of the artery supplying the colon show a wide variety, and surgeons have repeatedly investigated this variation because of the great surgical importance. The cause of the variation and majority of the anomalies of the colic arteries reported in adults have been explained intimately related to an embryonic elongation and rotation of the midgut during the development of superior mesenteric artery (Fig. 1). However, our two cases in which the colons were mostly supplied by the inferior mesenteric artery showed significant difficulty in explaining the embryological anomalies using this model (Fig. 2). To seek other morphogenetic mechanisms which cause the variation or anomalie of mesenteric arteries, we comprehensively reviewed embryological and anatomical studies on the colon, then sought potential relationships between the reported anomalous colic arteries related to the inferior mesenteric artery and their developmental causes. Although the inferior mesenteric artery supplied most of the colon in both cases, the distributing pattern and thickness of the root from the aorta were different. Fig. 1. a. 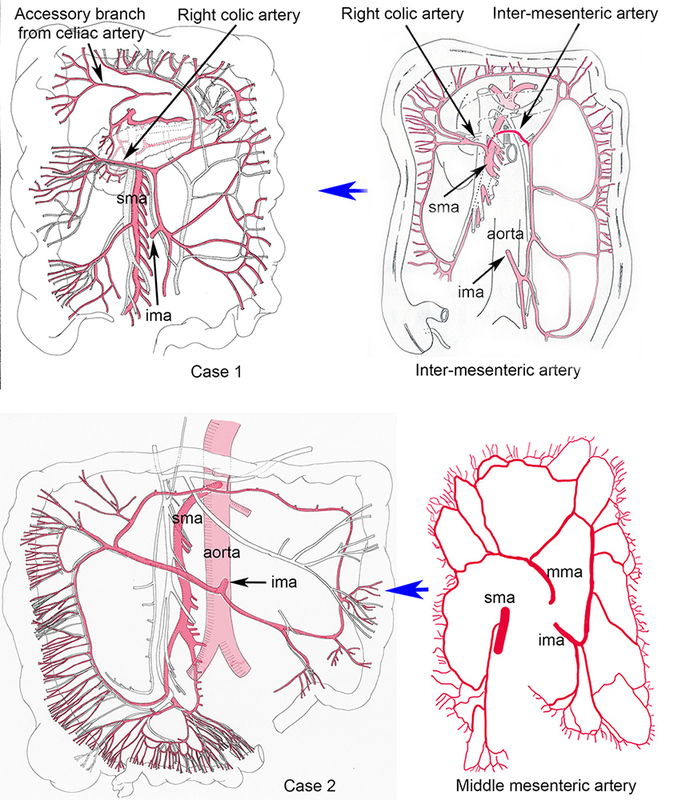 The general arterial branching pattern from the superior (sma) and the inferior mesenteric artery (ima) to the ascending (AC), transverse (TC), descending (DC), and sigmoid (SC) colons. b. Embryonic hernia model to explain the cause of the variation and the anomalies of the colic arteries reported in the adult human. Red arrowhead; anastomotic artery between sma and ima. In the case 1, the aberrant branch distributed to the mid ascending colon as an independent right colic artery. The inter-mesenteric artery is an anastomotic artery between the superior and the inferior mesenteric artery indicated possible course to that of Case 1 except its origin from the superior mesenteric artery. The anastomotic artery appears before the midgut rotation, but degenerates in late embryonic stages and remains as the embryonic remnant in 5% (15/300) in the adult human. We consider the aberrant right colic artery of the Case 1 to be the inter-mesenteric artery that secondarily lost its origin from the superior mesenteric artery. After the midgut rotation and the fusion of the greater omentum with the transverse colon, we supposed that the accessory branch distributed to the colon interrupted the distributing area of the aberrant inferior mesenteric artery. Fig. 2. nter-mesenteric artery after Okamoto et al. (1987). Middle mesenteric artery (mma) after Milnerowicz et al. (2012). In the Case 2, the aberrant branch of the inferior mesenteric artery shows the same distributing pattern to the remnant middle mesenteric artery reported in 0.05% (1/2076) and 0.1% (1/1000) cases in the adult human. Embryonic anonymous mesenteric artery directly originated from the aorta between the superior and inferior mesenteric arteries degenerates according to the development of the superior mesenteric artery during the elongation and rotation of the midgut but remains as the middle mesenteric artery distributed to the expected distal part of ascebding and transverse colon in the adult. We also noticed thick common trunk from the aorta. In the embryo, the points of origin from the aorta of the celiac and inferior mesenteric arteries shift toward the superior mesenteric artery, and excess caudal shift of the root of celiac artery to that of superior mesenteric artery causes thick celiaco-mesenteric artery. This arterial shift performed key role to determine the branching pattern from the aorta. We consider that cranial shift of inferior mesenteric artery on the aorta causes a common thick trunk with the remnant middle mesenteric artery as the middle-inferior mesenteric artery. Anomalous inferior mesenteric artery supplying the ascending, transverse, descending, and sigmoid colons.